By Antara Dasgupta in Aadhaar Card, Latest News on May 18, 2018 . Aadhaar, the 12 digit unique identification number has been made mandatory for availing almost all the other government services and benefits such as PAN Card, driving license, government subsidiary schemes, mobile phones etc. In this article we will discuss the ways to link Aadhaar Card with Mobile number. There are three methods offered by the government to complete the linking process which includes OTP (One Time Password), agent assisted authentication and IVRS (Interactive Voice Response) facility. Also, if an user choose to visit the mobile stores to register their biometrics and complete the linking process. In order to make the linking procedure easy for people, government has suggested telecom operators to facilitate request of OTP on mobile phones. This OTP method will help to e – verify mobile phones through websites or mobile phones. 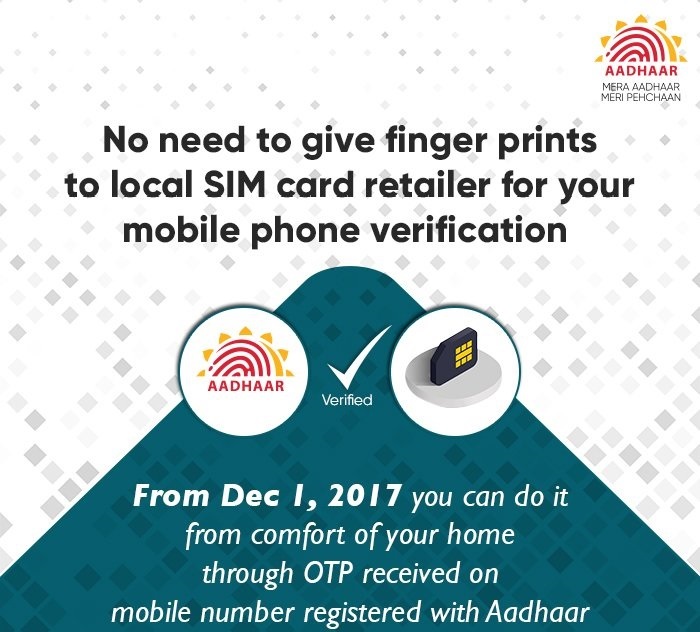 Because of the OTP method, the subscribers are not required to give fingerprints to local SIM card retailer for your mobile phone verification as from December 1, subscribers can link their Aadhaar card through OTP which they will receive on their registered mobile number. This method is easy and convenient. It is also a secured method as the telecom operators are instructed not to disclose the complete KYC (Know Your Customer) details of subscribers to agents unlike in the past. This method is used for SIM – verification and insurance verification. Also, the subscriber’s personal details are not stored on the agent’s device. Interactive Voice Response System (IVRS) is designed keeping the Aadhaar verification in mind. In case a subscriber opts for e – KYC (Know Your Customer), they are required to link their Aadhaar number with mobile. E – KYC is an Aadhaar based activation, which can be done at the time of taking the new connection. This e – KYC process is mandatory for both pre – paid and post – paid subscriber. It is an online procedure. Visit the nearest centre of your respective telecom operator. Submit the mobile number and Aadhaar card details. You will be provided with 4 – digit verification code that is an OTP to the subscriber’s mobile number from the re – verification application. Submit the OTP to store executive and provide biometrics. Receive a SMS after 24 hours. Reply “Y” in order to complete the e – KYC process. Also note that the government has instructed the telecom operators to provide the door step service to help completing the re – verification service to the senior citizens, disabled or chronically ill people. The telecom operators are setting – up an online mechanism so that citizens can request for door step Aadhaar verification. Can i link my Aadhaar with mobile number online.